CONSUMER’S EQUILIBRIUM We have discussed above two important laws of consumption. vil..• the law of diminishing marginal utility and the law of equi-marginal utility in terms of these laws, we can indicate the position of consumer’s equilibrium i.e., when the consumer attains a position of maximum satisfaction and would have no further incentive to make any change in the quantity of the commodity purchased. Equilibrium Wit” One Commodity Purchase. TIle law of diminishing marginal utility tells us the position of a consumer’s equilibrium in the case of a one-commodity purchase. He will go 011 buying successive units of the commodity till the marginal utility of the commodity becomes equal to price. If the price falls, he will buy more and the marginal utility will come down to the level of price. On the other hand, if the price goes up, naturally less will be purchased and the marginal utility goes up till it reaches the new (higher) level of price. In short. 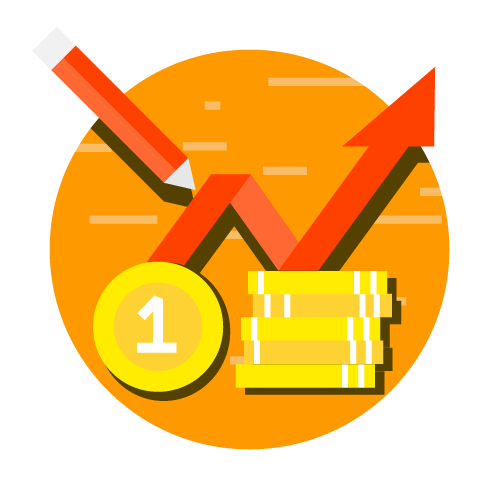 equality between marginal utility and price indicates the position of consumer’s equilibrium when only one commodity is being purchased and consumed. In case th-e consumer is buying two commodities X and Y, the position of equilibrium will be determined according to the law of cquimarginal utilities. It has already been stated that a consumer derives maximum satisfaction when the marginal utilities of the two commodities arc equal. 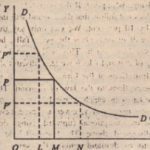 In case they arc not equal, adjustment will be made •in the matter of quantities purchased, (i.e., buying more of the commodity with higher marginal utility and buying less of the lower marginal utility commodity) till the marginal utilities of the two commodities are equalised, This is a position of maximum satisiaction. We assume rational behaviour on the part of the consumer so that it ‘is maximum satisfaction that he seeks and we suppose he is capable of making careful comparisons and calculations. Let us illustrate: Suppose the consumer is buying only two commodities X and Y. For arriving at an equilibrium position, i.e.. a position of maximum satisfaction. the consumer will take into consideration two factors, viz.., the marginal utilities of the two goods and their prices, given his money income thathe has to spend on the two commodities. A change in relative prices will naturally call for readjustment. Given the prices of X and Y, the consumer will be in equilibrium when the marginal utility of money expenditure on each good X and Y is the same. Now, the marginal utility of money expenditure on a good is equal to the marginal utility of the good divided by its price. symbolically, it can be put as: Hence MUE is marginal utility of expenditure. Suppose the prices of goods X and Y are Rs. 3 and Rs. 4 respectively. 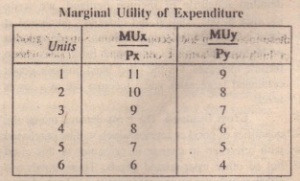 The above table can be reconstructed by dividing the marginal utilities of good X (MUx) by Rs. 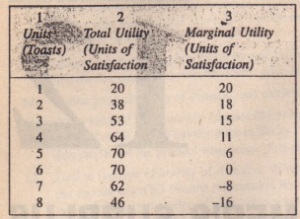 3 and the marginal utilities of good Y by Rs. 4. We obtain. A consumer will be in equilibrium position when the marginal utility of every rupee that he spends on each good is equal.